Hitler dreamt of completely reshaping Germany’s architectural landscape. For his Thousand-Year Reich, he preferred massive neo-classical buildings that delivered a message of power, severity, and stability. As a young man, Hitler had wanted to become an artist himself but was denied admission to Vienna's Academy of Fine Arts. After becoming chancellor, Hitler continued to take a passionate interest in art and architecture, putting both in the service of his totalitarian state. 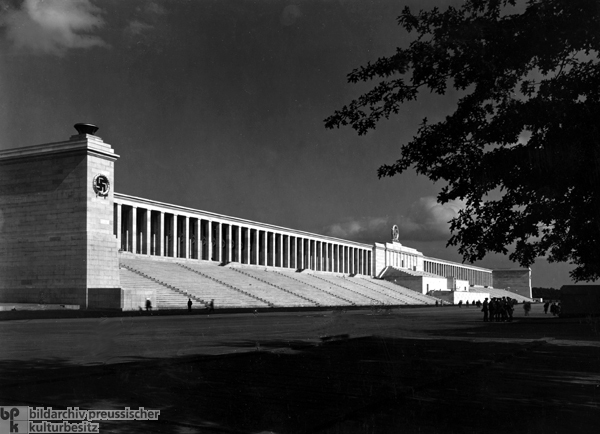 This photograph depicts the Zeppelin Grandstand, which occupied part of the Nazi party rally grounds in Nuremberg. Designed by Albert Speer and modeled on the Greek Pergamon Altar, it was 360 meters (1,180 feet) long and 23 meters (75 feet) high and could hold up to 50,000 spectators. The Zeppelin Field could hold up to 100,000 people and was used for Nazi mass propaganda events. Photo by Karl Kolb.